SkyHistory is a chat history manager for Skype that enables you to store and manage conversations, filter chats, and search through saved conversations according to the date. With the help of SkyHistory, you go through Skype chat history quickly and easily by means of search and filter application. Additional functions allow you to export Skype chat history to Excel CSV. Bookmark option keeps the most valuable and important messages around. Exports Skype history and categorizes the chats with the help of inbuilt calendar according to the date, the month and the year. Searches through Skype chat history by applying the filter. Organizes a single database to store Skype message history for all Skype clients you have. Makes important Skype messages be readily available. Add a bookmark and get the needed chat line in a blink of a second. 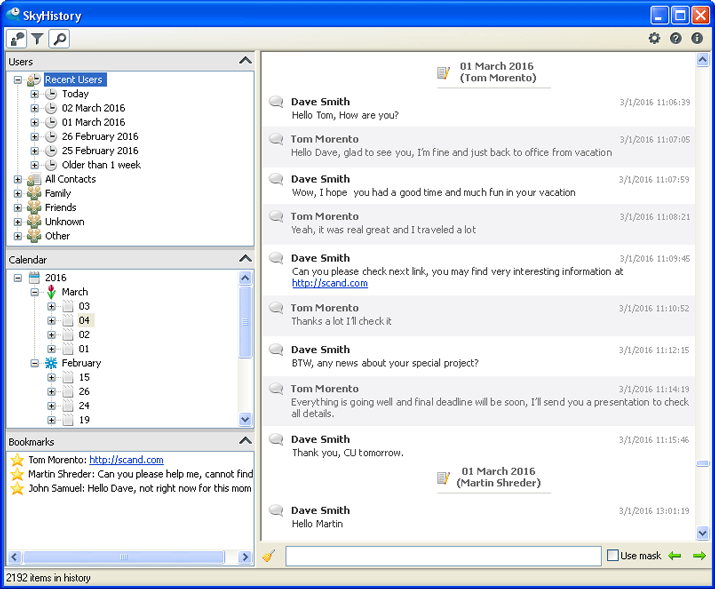 Customizes the chat history layout, allows playing with the background color, styles, and the message type itself. We have been receiving multiple requests from our users to enhance the product’s functionality by adding the option of exporting Skype chat history to Excel CSV. The new feature has been successfully implemented. Now, the search and filtering through Skype chat lines with our new version of SkyHistory is even easier!